Raymond Avenue borders Vassar College, residences, the Arlington Business District, open space, and an elementary school in the Town of Poughkeepsie. It is also known as Route 376, and was converted into a four lane minor arterial in the 1960s. This rightsizing project reconfigured 1.5 miles of Raymond Avenue to two lanes, calmed a previously unsafe corridor, and added a range of pedestrian and aesthetic improvements. In 1999, Project for Public Spaces was hired by Vassar College and the Arlington Steering Committee to study the Arlington Business District. Recommendations for the area included traffic calming, which prompted a redesign of Raymond Avenue by the New York State Department of Transportation (NYS DOT). 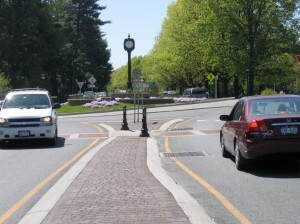 Phase I, which was completed in 2007, installed two roundabouts and a mid-block crossing on the southern portion of the street in front of Vassar College. Phase II included street landscaping and the installation of third roundabout that serves as a gateway to the business district. Several blocks of Raymond Avenue in the business district itself were also redesigned. The project succeeded at improving the pedestrian experience and safety, increasing aesthetic appeal, and supporting a vibrant business district. One lane was removed in each direction, such that the street was reduced from four to two lanes. Two roundabouts were constructed in Phase I, and a third was constructed in Phase II in order to slow traffic without impeding traffic flow. Each replaced a traffic signal. Sidewalks and parking were made more consistent along the corridor, as they were formerly only intermittent. Sidewalks were improved in the business district. Neckdowns were added at pedestrian crossings to raise pedestrians’ visibility, and reduce crossing distances. 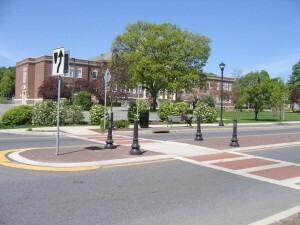 A center median with plantings and trees was built, which made space for pedestrian refuges at crossings. Lights were also installed in bollards at intersections to further raise pedestrian visibility. A mid-block crosswalk was changed at a highly trafficked pedestrian crossing that connects Vassar’s main campus to a path leading to student housing. This replaced a signalized crossing, which was possible because the crossing distance was reduced from four lanes to one lane by the street redesign and median island. Colored asphalt prints were installed, which delineated parking, sidewalks, and some medians. They visually unified the streetscape, particularly in the business district. The textured streetprint was placed in the road such that parked cars are encouraged to park close to the curb and it acts as a door zone so that parked cars do not open their doors into oncoming vehicles or bicyclists. 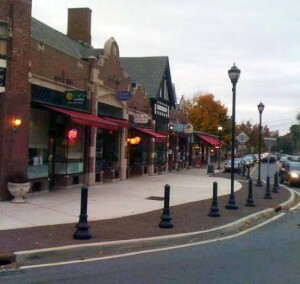 A study of the results of the Phase I redesign, which focused on the roadway in front of Vassar College, was undertaken prior to implementation of the Phase II redesign in the commercial district. These statistics refer to the outcomes of Phase I, utilizing data from May 2006 and May 2007, save for accident data, which compared alternate six month periods prior to and after Phase I’s installation because of time constraints. A full three-year before and after report is planned for 2013. Accidents decreased more than 50%, from 35 to 17 over two six-month periods. Vehicle speeds declined by about 24%, or nine miles per hour, in each direction. Corridor travel time increased by about 7%. Traffic delays decreased 56% at the roundabouts. Reducing delays also reduces emissions and thus improves air quality. Vehicle traffic along Raymond Avenue in front of Vassar College decreased 8.8%. Some parallel streets saw increases in traffic, while others saw a reduction or no change. The aggregated increases were less than the decrease of traffic on Raymond Avenue, and some of the decrease can be attributed to altered campus entrance/exit regulations. Traffic calming measures were successfully implemented to mitigate the initial traffic increase on Grand Avenue. Many new businesses have opened or expanded in the district since this project. Direct observations and video recordings revealed some confusion about the correct use of the roundabouts initially, which decreased over time. The roundabouts were built with raised truck aprons designed to be driven over by large vehicles, but some other vehicles were doing so unnecessarily, which caused design changes for Phase II to discourage that behavior. Comments were solicited from the public; one respondent noted that slower vehicle speeds result in reduced traffic noise. NYS DOT is now installing a similar project on nearby Route 55 in the Town of LaGrange, where the public reception has been positive. People saw the transformation of Raymond Avenue and want to see those changes on Route 55. There was some discord, with the Arlington Business District and the NYS DOT (which controls Raymond Avenue) supporting the rightsizing, and the Town and City of Poughkeepsie formally opposing the changes. A neighborhood group on Grand Avenue was particularly upset by their road’s potential use as an alternate thoroughfare. After mitigation measures were installed, the city and residents appear happier with the project. Anecdotally, Raymond Avenue traffic volumes have recently risen to their previous levels. A study is planned for 2013 to evaluate road operations and safety for both phases together with a three year before and three year after period.